I love to explore new things and I love to empower others to extend their horizons. I was born into a farming family in Germany. As long as I can remember l have risen to challenges and enjoy exploring new horizons. Mostly with much trepidation, having to overcome my insecurities and a lack of resources. A common theme is that I enjoy assisting others in reaching their potential. I love working cross-culturally with people from different cultural, social and language backgrounds. 2017 Enhanced Conversational Intelligence Practitioner C-IQ supported by WBECS. 2005 PhD: University of East Anglia, International Development Title: ‘Internationally Qualified Migrant Nurses in British Health Care Employment: their motivation, integration and contribution to capacity.’ ESRC Studentship grant. I have fun working and also do some fun things outside work! This year I am teaching myself to explore local rivers using an SUP (stand-up-paddleboard) which I added to my kayak. Further afield I go sailing with my husband and since we are equally qualified, we enjoy confusing people by saying that we are both the ‘captain.’ In reality we complement each other by having different strengths. I also love to be creative and enjoy beauty in art and our surroundings. 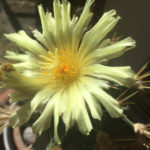 This cactus was a gift from a friend some 30+ years ago and only recently has it rewarded my TLC by presenting beautiful flowers – there is a lesson here about patience and perseverance!